A national organization that focuses on minority women’s issues will hold its summer institute Wednesday, Aug. 3, through Saturday, Aug. 6, at the University of Wyoming. The 2016 Mujeres Activas en Letras y Cambio Social (MALCS) Summer Institute will be held at the Marian H. Rochelle Gateway Center, Wyoming Union and the American Heritage Center. Approximately 175 participants have signed up for the conference. MALCS is a nonprofit national organization of Chicana, Afro/Asian-Latina, indigenous women, trans and gender nonconforming people that strives to represent and support such groups in its communities as well as in institutions of higher learning, according to the organization. It is an academic organization open to all indigenous women working toward the support, education and dissemination of Chicana/Latina and Native American women’s issues. This includes faculty, staff, graduate students, undergraduates and community members/activists. The organization’s members gather each year at a summer institute to network, share information and offer support. Chicana/Latina academic women gathered at the University of California-Davis in spring 1982 and created MALCS. This is due, in part, to the recent immigration/migration of newcomers who work in the natural resource and tourism industries in places such as Gillette, Jackson Hole, Rock Springs, Green River, Casper and Cheyenne, she adds. Aragon co-chairs the MALCS institute with Irlanda Jacinto, UW American Heritage Center university archivist. Two public events are scheduled during the four-day institute. Curator Jordan Dresser (Northern Arapaho) will introduce Ortegon’s original artwork, which was created specifically for the MALCS institute. Ortegon used traditional Native American bead work along with acrylic paint on a 30- by 30-foot canvas. 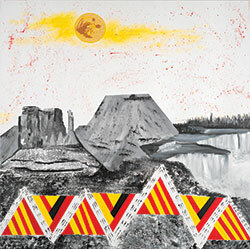 Ortegon says the square canvas mirrors Wyoming, since the borders of the state create a square. 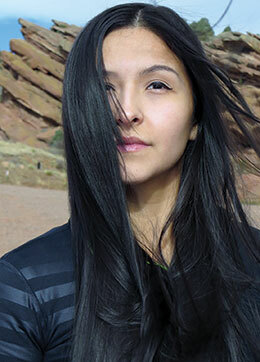 Ortegon, born in Denver, Colo., is a former Miss Native American USA (2013-14) and has Eastern Shoshone and Northern Arapaho roots in the Wind River Indian Reservation. She earned a Bachelor of Fine Arts from Metropolitan State College in Denver. Aztec Groupo Hutlzliopotchli also will perform during the institute’s opening reception. The second public event is the Tortuga Awards Banquet dinner Saturday, Aug. 6, at 6:30 p.m. in the Wyoming Union Ballroom. The cost is $45 per person. Tickets are available at the door, but RSVP is requested; email Robin Lopez at rlopez@uwyo.edu. UW President Laurie Nichols is the featured speaker. Three women will be honored at the event: Retired UW American Indian Studies Director Judy Antell will receive the MALCS Lifetime Leadership Award; Cheyenne-based Latina activist Ann Redman will receive the MALCS Service and Leadership Award; and Rosalía Solórzano Torres will be honored with the 2016 Tortuga Award. She is a faculty member at Pima Community College in Tucson, Ariz. Guest dancers and singers will be the Northern and Southern Plains dancers, with Elder John Emhoola. For more information, call Aragon at (307) 766-4124 or email ccaragon@uwyo.edu; or Jacinto at (307) 766-6832 or ijacinto@uwyo.edu.